St. Dominic, a Spanish theologian (circa 1170-1221) was the founder of the Roman Catholic religious order of Friars Preachers, or Dominicans. Around the year 1203, Dominic was sent by Pope Innocent III to South France to preach to the Albigenses. At the time, the Albigensian doctrine was based on a dualism of two eternally opposing principles, good and evil, all matter being regarded as evil and the creator of the material world as a devil. St. Dominic discovered that this doctrine was becoming widespread due to the fact that the Albigenses were well educated and well organized. To combat the unorthodox teachings of the Albigensians, Dominic organized and educated his preachers so they would be better equipped to overcome this Albigensian heresy. Dominic stressed the importance of education, and his preachers traveled throughout Europe and educated common people and religious leaders as a way to challenge the heresy. It was during Dominic's fight against this heresy when tradition tells how this saint received the rosary from the Virgin Mary in a vision. According to tradition, the Virgin Mary told him to "Pray my Psalter and teach it to your people. That prayer will never fail". Dominic was told that if he did as instructed, the heresy would be dispelled from France. Eventually after widespread teachings on the rosary and the meditations of the life, death, and resurrection of Christ, the heresy was defeated and the Church was strengthened. 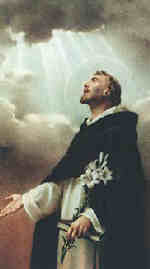 St. Dominic is widely associated with the origin and creation of the Rosary because he was the first to implement the widespread teaching of this sacred devotion. See also: History of the Rosary.